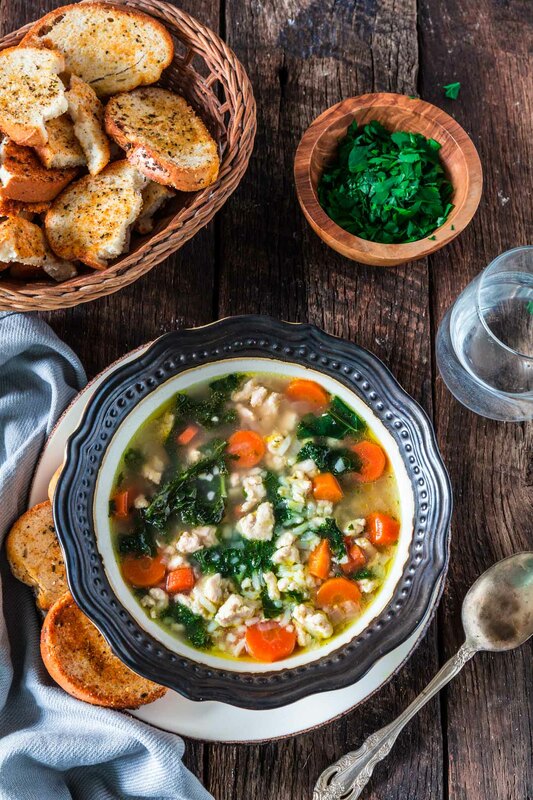 Nothing warms you up like a cozy bowl of Turkey, Kale and Rice Soup! Loaded with nutrients and low in fat, so you can stay true to your “eating healthy” New Year resolutions. While everybody and their mothers are recovering from all the fatty football food, Tim and I somehow managed to resist all temptations and eat something healthy for a change. But don’t feel sorry for us, on the contrary! This Turkey, Kale and Rice Soup definitely hit the spot and helped us stay warm on this bone-chillin cold Big Game Sunday. And tomorrow, when everyone is hungover and feeling lousy because of all the greasy indulgence, I will be feeling swell, with a lot of energy to work on a bunch of recipes and clean my whole apartment. Actually… scratch that! If the weather is as cold as it was today, my Brazilian body will be under the covers catching up on some Netflix shows. ??? And having some leftover soup, of course! ? Truth be told, I’m not really a football gal. But Tim was watching, so I started watching too and by the end of the game I had picked the team I wanted to win (“spoiler”: we lost!) and was yelling at the TV as if I had been born watching this sport. ??? But now, as I finish typing this post and start getting ready for bed, I am really glad we decided to skip all the partying and stayed home eating a comforting bowl of turkey rice soup. I feel light, cozy and oh so ready to get under the blankets! Insomnia, you have nothing on me tonight! And that makes me realize we need to have healthy yummy soup for dinner more often! The benefits are just too amazing. One of our New Year Resolutions this year is to eat better. Not lose weight or cut calories, but to eat things that are good for us and make us feel good! Either it’s in the form of this comforting turkey rice soup or in a hearty chili, tasty meatballs or carb free lettuce wraps, ground turkey definitely makes a weekly appearance in our lives! This recipe also works great with leftover turkey, like the day after Thanksgiving or Christmas. But for the rest of the year, make sure you stock up on some Jennie-O ground turkey, cause I guarantee you’ll be making this over and over again! In a large pot, heat the olive oil over medium high heat and, once hot, sauté the onion, garlic and carrots, stirring constantly, until slightly softened and beginning to brown, about 10 minutes. Add the ground turkey and cook until cooked through and white, about 5-8 minutes. Season with salt and pepper to taste. Add the rice and broth and bring to a boil. Then, stir in the kale, cover and simmer over medium low heat for 15-20 minutes or until the kale has wilted and the carrots are soft. Taste for seasoning and fix salt and pepper. My husband is big on soup and this one sounds right up his alley. I am going to have to make this for him. Mm, this soup looks so amazing. I love a delicious soup on cold nights. This was something new and my mom would love this. I will be glad to share this recipe with her and she could include this on her soup list. Mmmm what a delicious and hearty looking soup – good for you too! I have loads of leftover roast turkey from Christmas I could use up making this! yumm!! this is very interesting soup! would like to try the recipe! This soup looks so deliciously hearty and perfect for the chilly week we’re having. I love that the ground turkey lightens it up too. my hubby loves soup! it will be my first time to try this rice soup. it looks tasty! This soup looks amazing!!! I love soup this time of year, it’s amazing how much it can warm you up on a cold day! This looks like a super yummy and healthy soup. Bookmarking to try later. This soup looks delicious. I love soup this time of year. I am saving your recipe thank you ! This looks so delicious! It is getting so cold here! I absolutely love kale in soup! The only way I like Kale is in soup and this looks so delicious. I am absolutely going to make this soon. This recipe looks delicious. I’m on a big kale kick right now and this will be perfect to try! I never thought of putting kale in a soup but this looks so yummy! I might’ve to try making this for my family. I like an easy and fast recipe. So this one is right up my alley. Thanks for sharing! Amazing soup. So perfect especially as it has been cold and stormy here. So comforting!